Our central aim is to establish and maintain oral health. This we do through a combination of examinations to identify and treat conditions at an early stage. The major dental ailments – tooth decay and gum disease - are preventable, and with knowledge and commitment we can guide you to the ‘gold standard’ of teeth-for-life. At every examination for both new and existing patients we examine your mouth and surrounding areas for signs of disease. This includes the soft tissues of the cheeks lips and tongue to look for signs of oral cancer and other conditions. We check your teeth to look for signs of decay, wear or other conditions and also examine your gums for signs of gum disease. Nobody wants to think about cancer, but we all agree that early detection provides the best outcome. In the UK there are around 6000 cases of oral cancer diagnosed each year. As part of our examinations we check your mouth for changes which can be the early signs of oral cancer. There is a strong link with tobacco use as well as a link with alcohol use. Please do not be offended when we ask about these habits, we only have your health in mind. Over exposure to the sun can increase the risk of cancer of the lips – so slap on the sun block! Prevention forms the basis of successful modern dentistry. For Kids we want to prevent decay starting. For those of us who have already experienced decay, we want to prevent it returning and prolong the life of our fillings and crowns. From an early age action can be taken to reduce the experience of dental disease. For people who have had dental disease prevention is the key to avoiding further disease and to prolonging the life of restorations. Sugar in our food and drinks feeds the bacteria in our mouth to form a smear layer that sticks to our teeth – we call this dental plaque. From this smear layer, or plaque, acid attacks the surface of our teeth. Repeat these acid attacks often enough and we end up with holes, or cavities, in our teeth. This is totally preventable. Our teeth have some capacity to resist decay. If the frequency of sugar intake exceeds the repair capacity, then decay will occur. It is for this reason that the intake of sugar containing foods should be limited and avoided between meals. Regular brushing and flossing will clean plaque off the surface of your teeth and regular attendance at the dentist will detect any decay at an early stage. Gum disease is caused by your body's reaction to the plaque and tartar that build up on your teeth. Some people, around 10% of us, can be seriously affected to the stage that we can lose some or all of our teeth. What to look for? Bleeding of the gums when brushing or flossing is a sign that the gums are inflamed. Bleeding does not occur in healthy gums. If left unchecked, this inflammation can trigger the bone that holds the teeth in place to dissolve away resulting in the loss of the tooth. Treatment aims are simple – a dental clean up followed by a thorough home care regime to reduce the plaque/tartar build up on a daily basis. Risk factors? Smoking is now known to cause more severe gum problems and reduce the effectiveness of treatment. Uncontrolled diabetes can make mild gum disease more severe and during pregnancy gums are more sensitive to plaque but this is usually reversible when the pregnancy ends. The hygienist is central to the care of your mouth. The hygienist’s main role is in relation to the prevention and treatment of gum disease. 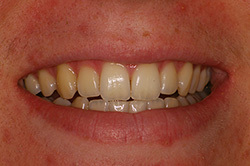 This is achieved by professional cleaning of teeth. This can be as a routine maintenance treatment or as part of treatment of active disease. Another part of the hygienist’s role is in educating patients in ways to look after their teeth at home and prevent disease. Our hygienists also help us deliver Childsmile to our younger patients.